At the end of this page, you can also review our recommended best practices for making your website accessible to all users. Making your website accessible refers to the process of using web authoring conventions to make your website easier to read for those who access your web content using screen readers. Read more about web accessibility and making content accessible for screen readers. The tools menu appears above the space for content. The menu includes standard font options for formatting text, changing its color, size and alignment, and creating lists. It is possible to create tables, although this is not recommended as they are difficult to edit once they are set up. One of the strengths of the editor is that it can link to other web sites, applications, and multimedia content. To hyperlink to a different website, simply click on the chain icon to insert a web address which will then be embedded in the text, like this link to the BC web site. To add a photo or picture, click the mountain picture to make a link to an image you’ve found online. These images will appear on the screen similar to the screenshots we have on this page. Additional links offer access to content that can be integrated directly onto the page. Click the Square Root icon to open the equation editor. Click the YouTube icon to search for and embed a video (see the example below). Click the T icon to search for and embed images from TED Ed. The blue downward arrow opens a menu of further content types that can be embedded using the editor. Click the play icon to record audio and video, using the web cam and microphone on your computer. The editor also allows you to link to other tools in your Canvas site. 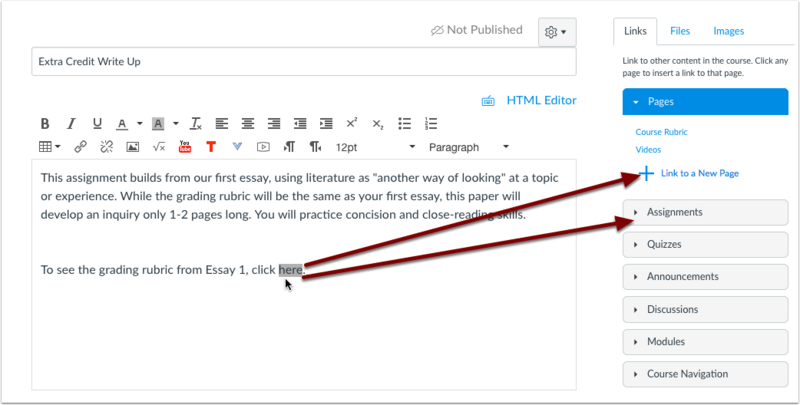 Click “Links” on the right of the screen to select from the pages, assignments, discussions, quizzes, and other content you already have. To create a new page as you are linking to it, select Wiki Pages and scroll to the bottom. Click “Files” to select any documents you’ve uploaded, or to bring in a new one. Click “Images” to browse thumbnails of existing images, or bring in a new one. 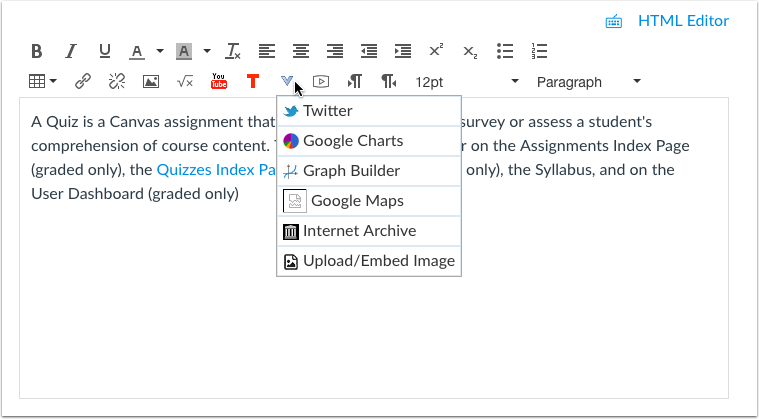 Using this editor, you can make your content more easily accessible to students with disabilities who may access your course using screen readers. 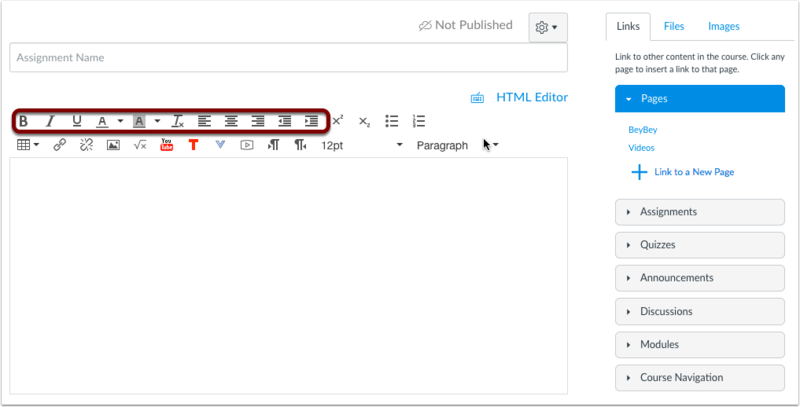 Using the headings under the style menu of the content editor allows students using screen readers to (non-visually) recognize hierarchical organization of content and quickly browse through section headers. Students are able to better understand what images are displayed with the assistance of alternative text, or “alt text”. “Alt text” provides a quick description of the image. How to upload an image from the web, home computer, or Flickr and include alt text. 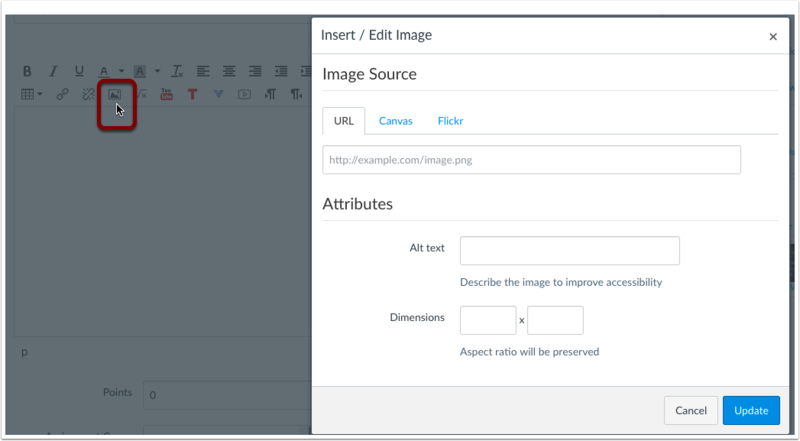 Note: Contrary to the page linked above, Canvas does allow uploaded images to include alt text. Canvas allows users to create captioning for the videos they create as well as external (e.g. YouTube) videos. Further information on the Rich Content Editor can be found in the Rich Content Editor Chapter on the Instructure website.